Carnival Corp today expanded the role of Michael Thamm, who is currently the CEO of the Costa Group which includes their Costa and AIDA brands. He will now also become CEO of Carnival Asia, thus being responsible for the company's entire operation in China and Asia. Carnival Corp and Fincantieri said today they have signed a memorandum of agreement to build two large ships for delivery in 2021 and 2022. The ships are designated for the Holland America and Princess brands. Carnival Cruise Line has added a new fish and seafood eatery aboard their two Australian-based ships, Carnival Spirit and Carnival Legend. The new Seafood Corner will be serving up local favorites such as fish'n'chips, seafood platters and lobster rolls. Local prawns, oysters and fresh whole fish such as barramundi, snapper and flounder will also be cooked to order. The Port of Galveston prevailed in the lawsuit three local remote parking lots filed against the port over access fees the port is charging them to drop off and pick up customers at the port for their cruises. “So what?” you're thinking. You live in Florida, so you don't care about parking in Texas. You should care about this because the ruling does set a precedent that could give a green light to ports all over to raise fees, and in turn that will cause the private lots to have to raise their parking rates. It could even affect taxis and limos coming to the port. Miami is often the focus of activity in the cruise industry, but today it was 65 miles east of there on a private island in the Bahamas. 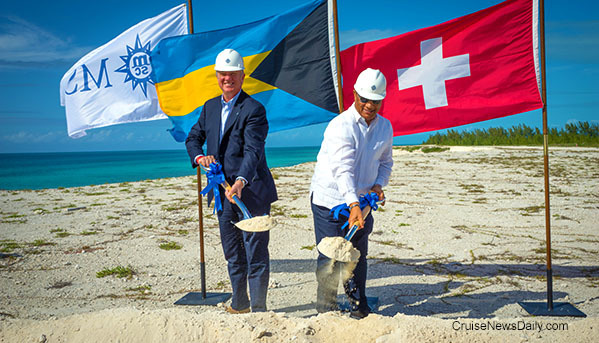 MSC was breaking ground on what will become Ocean Can Marine Reserve, and a popular port of call on their Caribbean programs. MSC will welcome their first customers to the completed island in November 2018. Details appeared in the January 17 edition of Cruise News Daily. 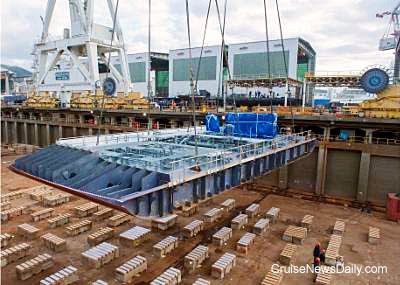 It was just a little more than a month ago we reported that Fincantieri had laid the keel for Seabourn Ovation, meaning the ship has almost its entire construction process ahead of it. At this point, what's sitting on blocks in the bottom of the dry dock doesn't even look like a ship. Fast forward to Seattle today. Seabourn opened the books on Seabourn Ovation and began taking reservations for its inaugural season, beginning with its inaugural cruise from Venice to Barcelona on May 5, 2018, a little less than 16 months from now. The complete story appeared in the January 17 edition of Cruise News Daily. Photo courtesy of Seabourn Cruises. All rights reserved. May not be copied or used without express permission. Award-winning small ship line, poised for quantum leap in guest experiences, welcomes cuisine, beverage and hospitality guru on board. Seattle, WA, January 17, 2017 — Windstar Cruises announces that Peter Tobler has joined the small ship cruise line as Director of Marine Hotel Operations. In his new position, Tobler is responsible for overall leadership and guiding principles overseeing hotel management for the six ship fleet including food and beverage operations, revenue, product development, service standards, and employee training and development. Tobler’s 30-plus years of hospitality, travel and cruise experience spans completely complements the impressive talent team found both aboard and on shore at Windstar Cruises. Tobler begins with Windstar immediately, fresh off running his own business, consulting on strategic development and implementation of global culinary operations. Prior to that, Tobler held successive positions as vice president of culinary/food and beverage, managing worldwide operations for Princess Cruises and Norwegian Cruise Line, as well as director of food and beverage operations for luxury operators Seabourn and Cunard. Tobler started his cruise career as a Hotel Manager at Seabourn working on board Windstar’s now Star-class yachts, fostering his true guest-centric perspective, and extensive knowledge of the remarkable growth and innovations in the world of cruising. Tobler’s recent cruise industry successes include acting as team lead and receiving the Best Cruises for Food Lovers distinction by Food & Wine Magazine; recognition by the Seatrade Insider Cruise Award for the Chef’s Table, and a 31st Annual Telly Award for Love at First Sip; as well as an award-winning partnership with world-renowned Master Chocolatier Norman Love for Chocolate Journeys. Educated at renowned institutions, namely the School of Hotel Administration at Cornell University, the UCLA Anderson School of Management, the Culinary Institute of Zurich in Switzerland, and the Culinary Institute of America (CIA), Tobler is a lifetime member of the Cornell Society of Hotelmen and past president and chairman of the board of directors for the Marine Hotel Association. Tobler is relocating to Seattle to join the 130-plus employees on the Windstar team in the cruise line’s corporate headquarters. He will lead an 800-strong team of ship culinary and service staff and crew across the six-ship yacht fleet, offering more than 250 cruises annually sailing to 170 ports worldwide. The leader in small ship cruising recently won the “10Best” award as #1 Best Boutique Cruise Line voted on by readers of USA Today and was named to Condé Nast Traveler’s 2017 Gold List. The Juneau Assembly (city council) has voted in favor of a proposal to exempt sales of goods and services sold aboard cruise ships while they are in port, from city sales taxes. In practice, the sales are minimal and the cruise lines just don't collect or pay the taxes, but the city is moving ahead drafting an ordinance formalizing the exemption after the Assembly vote. Onboard shops are closed while the ships are in port, and most of what they should be collected on are beverage sales, specialty food sales and the like. The complete story appeared in the January 16 edition of Cruise News Daily. Details appeared in the January 16 edition of Cruise News Daily.